This is one of those things that really needs to be seen in order to believe it. This maniac took a Lamborghini Huracan and used it as an obstacle when firing a 20mm cannon at some unsuspecting watermelons placed on the other side of the car. Granted, the windows were open so if he makes a perfect shot, the beautiful bright red Lambo would remain unharmed. However, a 20mm cannon is some serious firepower, so if he missed even by a little the car would be destroyed. The brainchild behind this obnoxious stunt is Edwin Sarkissian, and the only thing he loves as much or more than his supercars, are guns. His gun of choice is a Typhoon 20mm cannon that’s built and owned by Mark Serbu, who is a highly respected in the gun world who also happens to have a love affair for supercars. So he was the perfect person for Sarkissian to link up with in order to have the best chances of pulling this stunt off. 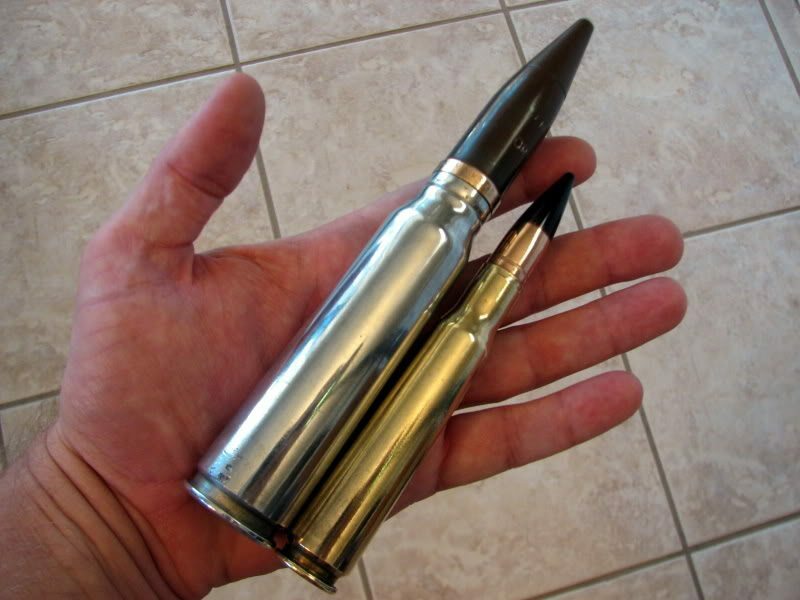 For those of you unfamiliar with the 20mm round, it’s massive. It’s almost twice the size of a .50 Cal and is commonly used in weapons attached to attack helicopters and fighter jets. The round itself measures at approximately three-quarters of an inch in diameter and the entire cartridge can be anywhere from six and three-quarters to 11 inches long depending on what type it is. On average it travels at 800 meters (or 2,400 feet) per second, which is almost three football fields in the blink of an eye. So again, if it were to miss and hit the Huracan we would be talking about some serious damage beyond repair, especially at such close range. Even though the Huracan’s windows are down, there isn’t a large margin of error. From top to bottom the window opening is just under a foot tall and only 3.5 feet from side to side. And it of course has to travel through both sides. Something else you have to consider is the shock wave from a round of this size being fired. After all it is referred to as a “cannon” more so than a rifle. As Sarkissian mentions in the video, there’s not really a way to explain this sort of thing to an insurance company in a worst case scenario type situation. Luckily though, the only thing that got destroyed was the two watermelons set up on the other side of the car. While some of you might’ve wanted to see what would happen if he did miss, it was still a spectacular sight to behold even though everything went according to plan. Here’s another video that shows how big and powerful the 20mm cannon is.